What is a great application of these passages? What would we be doing if and when the Savor comes? How should we be living? While I am aware of the song “Live Like You Were Dying,” I think that perhaps there is more to life than skydiving and Rocky Mountain climbing. In one way we think a great deal too much of the atomic bomb. “How are we to live in an atomic age?” [one might ask]. I am tempted to reply: “Why, as you would have lived in the sixteenth century when the plague visited London almost every year, or as you would have lived in a Viking age when raiders from Scandinavia might land and cut your throat any night; or indeed, as you are already living in an age of cancer, an age of syphilis, an age of paralysis, an age of air raids, and age of railway accidents, an age of motor accidents.” In other words, do not let us begin by exaggerating the novelty of our situation. Believe me…you and all whom you love were already sentenced to death before the atomic bomb was invented: and quite a high percentage of us were going to die in unpleasant ways…It is perfectly ridiculous to go about whimpering and drawing long faces because the scientists have added one more chance of painful and premature death to a world which already bristled with such chances and in which death itself was not a chance at all, but a certainty…If we are all going to be destroyed by an atomic bomb, let that bomb when it comes find us doing sensible and human things — praying, working, teaching, reading, listening to music, bathing the children, playing tennis, chatting to our friends over a pint and a game of darts — not huddled together like frightened sheep and thinking about bombs. 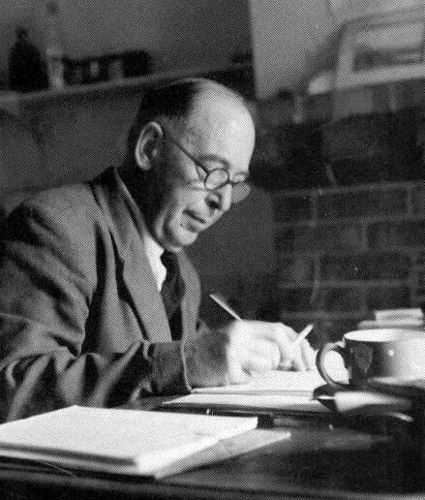 They may break our bodies (a microbe can do that) but they need not dominate our minds (C. S. Lewis, “On Living in an Atomic Age,” in Present Concerns, 73-74). This entry was posted in Apocalyptic Literature, Jesus Christ, New Testament and tagged Apocalyptic Literature, Application, applying the scriptures to our lives, Matthew 24, scriptural application, scripture, Second Coming. Bookmark the permalink.